We have created the CrowdsCure Challenge Platform, a place where open Innovation contests can be powered by crowdfunding. Contests are a great way to crowdsource innovative ideas and when combined with crowdjudging through crowdfunding you do not only get innovators involved, but potential partners and millions of members of theCrowd that Cares (see example here.) When the general public gets behind an idea, amazing things happen. As Challenge sponsors, our government and corporate clients can lay out a problem they want solved and ask the Crowd to help by providing their best solutions and backing the ones they like best. It is a great way to “Crowd Test before you Invest”, removing risk and adding in massive awareness and adoption, often before a product even exists. Please be welcome to take a tour of our Crowds Cure Platform or see the examples below. At our fully functional Demo site you can see the initial challenge splash page with links to rules, important dates, judging criteria, and an extensive application, all of which are customizeable. Typically a challenge runs in two phases with an application and initial judging period. Judging can be crowdsourced or in house, or a combination therein. Next, all finalists are launched in tandem for a defined period of crowdfunding where hundreds of thousands, perhaps millions, of patients, physicians, nurses, healthcare workers and leaders, and the people that care for them will review the finalists in a special section on MedStartr. Finally, using this additional data regarding adoption and public support, a winner can be selected based upon amount of funds raised, number of backers, client acquisitions, social media shares, user engagement, or other criteria the sponsor selects. When all the votes are in the Sponsor announces the winners and welcomes their newest partners, investments, and ideas that were deemed most worthy by the people that matter most in healthcare, the people who will use the innovation to get and give better care. These aren’t meaningless popularity contests where the winner is whoever gets the most “likes”, your crowdfunding challenge winners will be informed by a true market test of who will buy what they are building, and that makes all the difference. Sierra Wireless was looking for a few Healthy Machines, devices that would use their wireless technology chipset embedded into their device. They weren’t offering a prize, but they were willing to give their partner developer package ($895 value) to two winners. So they came to us and we developed a quick contest application that would help fill their partnership funnel. Results: Two great new partners and lots of applicants. Check out their challenge here! We are also proud to have assisted the National Cancer Institute and the Office of the National Coordinator for Health IT in our first ever contest for the US government called the Crowds Care for Cancer challenge. Wanting to find a more democratic way to decide who wins government grants and seeking to fill an app gap for cancer survivors, Adam Wong of the ONC and Dr. Abdul Shaik from the NCI proposed that we ask the crowd to “fire up their napkins” and design some great ways for doctors and Patients to stay connected with their care. Results: Phase 1: In 30 days we received 1.7 million impressions in twitter and had 30 great challenge applicants, about three times the projected entrants for a challenge this size. We had assembled a panel of judges that were cancer survivors, oncologists, designers, and leaders of organizations such as Livestrong, ACS, Cancer101, StupidCancer.org, and Happtique that were not only fantastic judges representing patients and providers well, but also could help spread the word to 14 million cancer survivors and Innovators. Phase 2: Three finalists were selected and crowdfunding optimization began. Over 3 days we conducted a crowdfunding boot camp and got videos, text, and rewards created for all three finalists (see them here.) They did a fantastic job, as did our crowdfunding coaches. This showed when the finalists raised more money on MedStartr than the finalist prizes were! After 30 days of online crowdfunding the finalists submitted their prototypes and the judges again reviewed, this time with actual crowd metrics and engagement data. They selected the final winner and went on Ben Chodor’s mHealthzone to announce it (listen here.) The Grand Prize Winner, Dr. Michelle Longmire of Together was also showcased at the Rock Health Digital Health Summit. All told, the contest garnered over 4.7 million impressions on twitter, helped generate 25 news stories about the challenge and winners, and enabled three great ideas get found and funded faster. Most importantly, these solutions can now be found online and are helping cancer survivors stay better connected with their care. For more information, please see the case study we did on this challenge. Want 40x Return on Innovation Investment in a month? 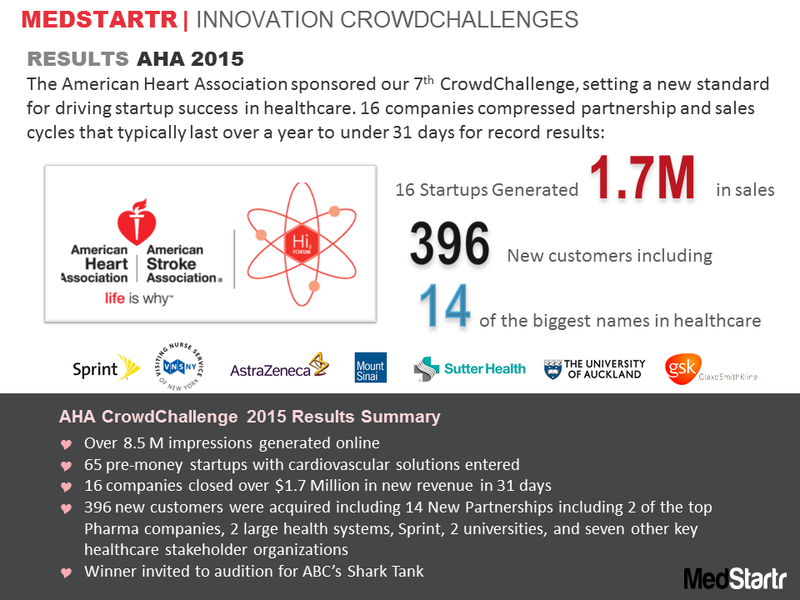 Our most recent crowdchallenge, our 3rd for the American heart Association helped 16 new healthcare companies do 1.7 M in new business in 31 days. Here is a summary of those results. How can we help your organization with our Open Innovation Ecosystem? We run events, challenges, community engagement programs, workshops, social media campaigns, public relations programs, and more. We are ready and uniquely able to help your organization meet its goals for finding partners, investments, worthy projects, and more. To learn more about our Open Innovation Offerings, please read more here.